BE MOVED BY THE CREATIVE SPIRIT. The Talmadge Art show is a homegrown, quality handmade art show produced and showcased in San Diego, CA. Now accepting applications for upcoming art shows. See available dates on application. Our amazing artists have offered once-in-a-lifetime, hands-on art classes on-site at our various Art Shows. See below for information on an upcoming art class at our May 19, 2019 show and register today. 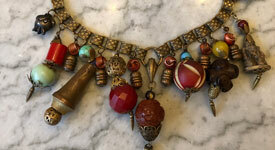 Here’s your opportunity to create a unique wearable art piece from upcycled jewelry. You will start with a metal base and choose from a variety of vintage and found pieces to embellish it. Plus, you are encouraged to bring personal pieces to incorporate, such as single earrings, broken brooches, beads or buttons. As an option, the jewelry pieces can be attached to a chain for a charm necklace. The class includes all materials and you will leave with a finished piece to wear. Hear from some of our attending artists about their experience at Talmadge Art Show. Talmadge Art Show has been a gift to the public for many years. 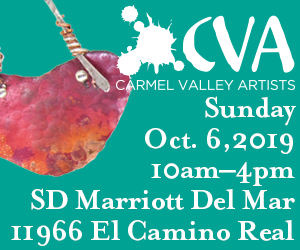 It is the best art show in San Diego, and gives local artists a venue for their creations. Sharon and Alan are wonderful to work with. The Talmadge show is the only show I do where help is available to help you get your merchandise in and out, and set up, and have people on hand so artists can take a break throughout the show. Sharon and Alan go above and beyond in producing the show and in how they treat all the artists and all of our clients. They continue to add features to the show to enhance the experience for all who attend in any capacity; like the art classes that have been recently added. Talmadge Days are a highlight! I cannot thank them enough. A very professionally and competently produced show. I’ve been a vendor at Talmadge Art Show since 2006 and have seen it grow by leaps and bounds. Events are run smoothly and efficiently, with extensive advertising and a sizable mailing list. The producers know how to draw a crowd and operate it like the business that it is. All of this translates to the success of vendors too. As an independent artisan, this is a must-do show for me.